Mommy Tang has shown everyone that Asian food can be vegan too, such as with Vegan Korean Soft Tofu Soup and Vegan Mapo Tofu. 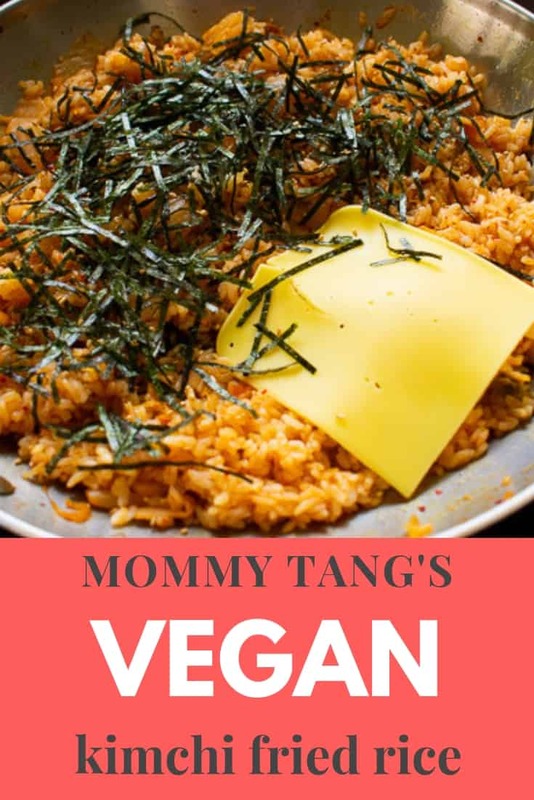 Mommy Tang is the creator and star of the first ever vegan “mukbang”, a Korean television format where people eat and chat. She quickly became a YouTube sensation amassing 400,000+ subscribers due to her uncanny ability to honestly share her life, family, and recipes with anyone who happened to watch. Her vegan dishes continue to inspire many, including in this vegan kimchi fried rice. Her whimsical drink pairing with vegan chocolate milk is so unique, fun, and just like her. Ingredient quantities were assumed, since she does not give measurements in the original video. The key to vegan kimchi fried rice is, of course, the vegan kimchi. Kimchi is traditionally made with some type of fish or umami flavor. 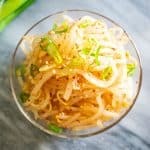 Either fish sauce, salted shrimp, or even beef stock lends the fermented pickle its characteristic depth of flavor. Without it, does the kimchi taste like kimchi? Two store brought brands are featured below that inventively “make-up” for the fish flavor. Ingredients: Napa cabbage, yellow onion, green onion, green red chile pepper flakes, less than 2% of: salt, fresh peeled garlic, fresh ginger, organic sugar. “Our best tasting vegan kimchi has all of the zest, spice, and complexity found in our traditional recipes,” claims the label, and it definitely is zesty. Extremely zippy, in fact. It does not try to compensate for the lack of fish, but instead overpowers the palate with an unusual sour kick start, which is surprisingly addictive. This is the vegan kimchi Mommy Tang uses her in video. 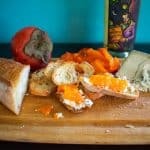 Distributed out of Long Island City, New York, the label also notes that “bubbling and overflow may occur due to raw, natural fermentation,” so a curiously placed rectangular sticker is attached to the jar to keep it from popping off. Handmade in small batches in San Francisco, the packaging is almost as interesting as the kimchi itself. There is an air valve on the back of the BPA and Phthalate free plastic bag that allows the kimchi to breathe. “With far fewer resources to produce, package, and transport, this pouch dramatically reduces our carbon footprint,” states this eco-conscious label. Even after three months of opening the bag, the kimchi did indeed still taste fresh and had not yet succumbed to the over-fermented, sour fate that all kimchi will eventually meet. 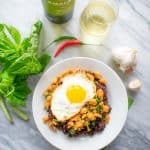 The ingredients are similar to Mother In Law’s vegan kimchi, except for the addition of kelp powder, which did make it taste similar to traditional kimchi, and the overall combination of spices and aromatics hit all the right spots on the palate. For the purposes of this vegan fried rice, the Sinto brand is recommended. Since the kimchi will be cooked, it has a little more depth that will help season the rice. The Mother-in-Law brand would best be eaten raw to preserve its zippy, fresh flavors. Typically cold, cooked rice is used for fried rice. 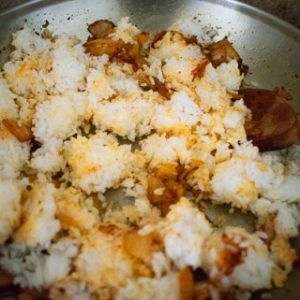 Can you still use hot rice? Yes, but the grains will not easily separate, and you can end up mashing the rice. A non-stick pan is recommended because the rice will stick to a regular pan. 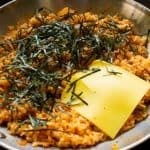 Either you need to add more oil, which will make the fried rice tastier, but be prepared to also scrub off the rice that sticks to the bottom. 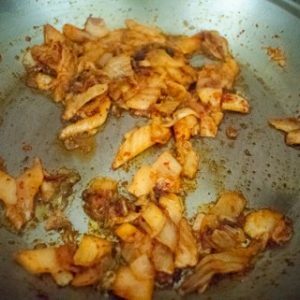 Be sure to cook the kimchi thoroughly, otherwise, it will be very crunchy and raw tasting. 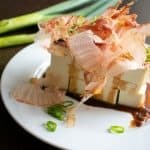 The garnishes of sesame seeds and nori are key for adding umami flavor to this dish, especially if you do not top with vegan cheese. Any vegan chocolate milk will do, whether made from nuts, rice, or soy. The Rebel Kitchen brand is pictured above that is made with coconut milk. 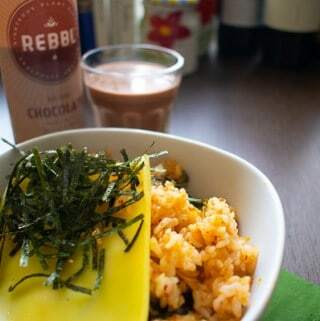 The creaminess of the milk and subtle bitterness of the chocolate complement the heat and spice of the kimchi. The combination is sweet, spicy, and unabashedly unique, just like Mommy Tang. Nobody does it quite like Mommy Tang, and this vegan kimchi fried rice with sliced cheese is no exception. Serve with a vegan chocolate milk for a sweet-spicy combination. 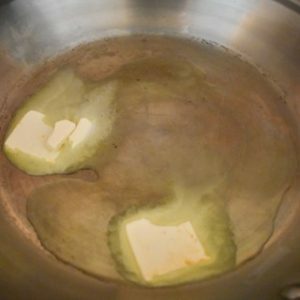 Over medium high heat, melt the oil and non-hydrogenated margarine together. Add chopped kimchi and stir fry for 3-5 minutes until the kimchi is translucent. If it is already translucent to begin with, it should be softened and cooked through without a harsh bite. Add cold rice, agave or sugar, and salt. Stir fry for another 4-5 minutes until the rice is completely heated through. Season with tamari or soy sauce and remove from heat. Top the skillet with garnishes and serve from the pan. 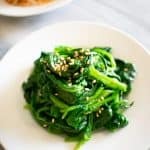 The vegan kimchi, seaweed strips, and sesame seeds are key to this dish. The rice should be cold, so the grains will separate individually while stir-frying and become coated with oil. Use a non-stick skillet for easy clean-up.